Wired with one candelabra socket, 25 watts max. 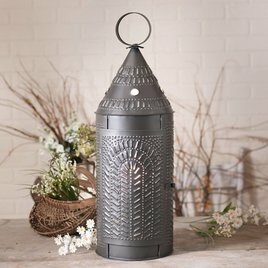 Thank you for choosing to shop with us and considering our Punched Tin Lanterns! Sign up for our Nanas Email List! Here's a perfect accent light, the Round Lantern. With it's small size it will look great in a small space. It has a smokey black finish which brings back a touch of Colonial days. Wired with one candelabra socket, 60 watts max. Line switch on cord. The traditional Harbor Lamp Base is perfectly sized for the larger areas of your country home. 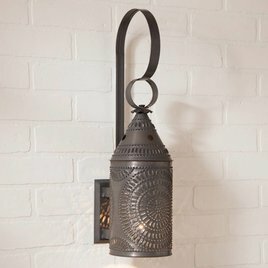 Designed to resemble the antique lanterns of years gone by, this lamp has a classic and sophisticated charm. Shade not included. Made in USA. 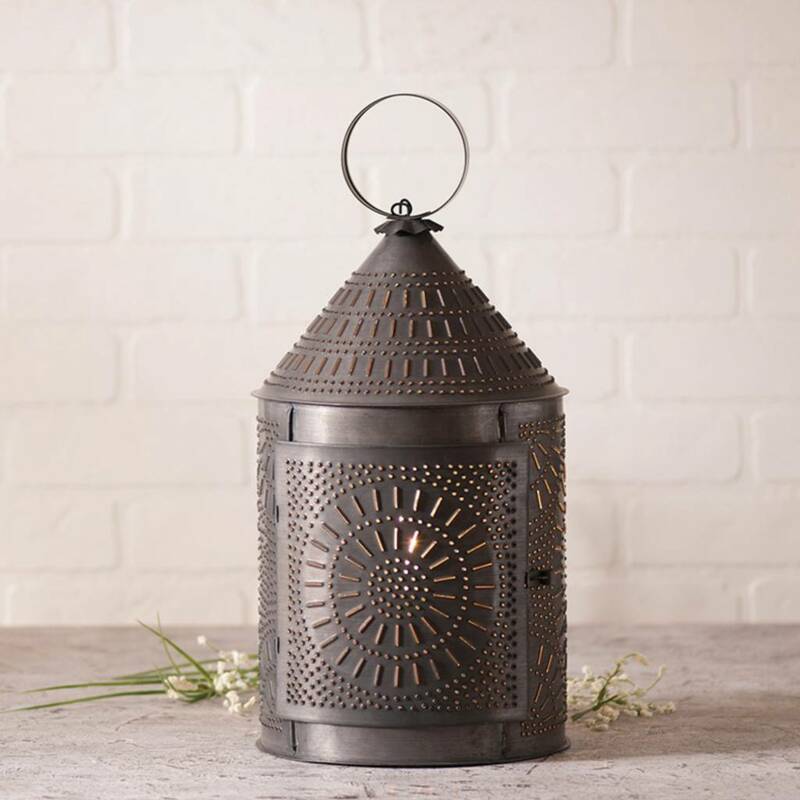 The Tinner's Lantern with Chisel in Blackened Tin is an oversized lantern with punched tin details. 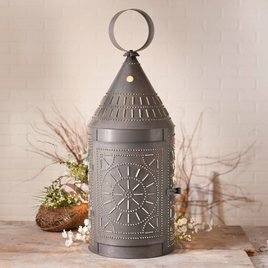 This hand-punched and finished lantern will be stunning in your country home. Made in the USA. The Fireside Lamp base is well sized for larger areas of your home. 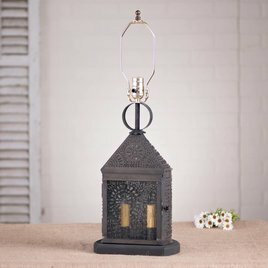 Designed by Irvin to resemble the antique lanterns of years gone by, this lamp base has a classic and sophisticated charm. 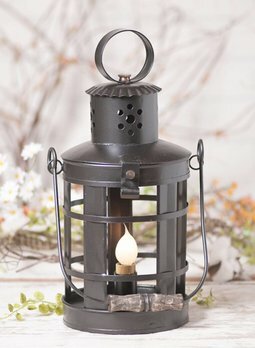 The Harbor Lantern is much like the ones used by early settlers in the Colonies. Imagine this lantern in the coastal towns and in their harbors. 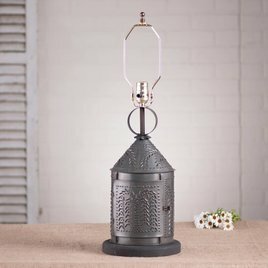 Luckily for us this Lantern has been electrified and beautiful punch pattern added. Made in the USA. 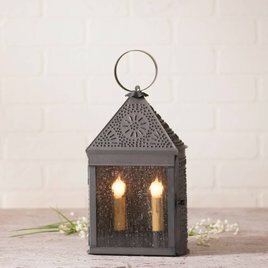 The timeless & beautiful Cathedral Lantern brings a warm glow indoors or outdoors. 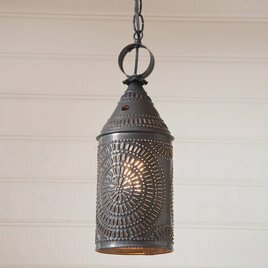 Perfect for your covered porch or patio with a pattern of light. Imagine the oohs and aahs when your friends and neighbors stop by to visit.